Hello all and welcome to my second Christmas related project. Have you ever received a really boring Christmas card? Have you ever sat there and thought to yourself "If only there were a little video game on this card that I could play..." Well ponder no more because that card is here! This instructable will show you how to make your very own retro video game Christmas card which can be made for less than $10. All you need is some time, some soldering know how and roughly $10 in your wallet. There are essentially two main parts to building this project. Anyway - lets get started shall we! Step 1: Gathering Together the Required Parts. As stated in the introduction, there are essentially two main parts to this instructable. - Pay a visit to sure electronics webstore where you can buy a lot of 10 Led matrix displays for around $8.60 this makes them 86c each! - ebay is a great place to buy electronic components. Make sure you do a worldwide search since postage is normally quite cheap for lightweight components. - Head on over to microchip.com and sign up to their online store. Then you can buy parts directly from them. For example here in Australia it would cost me $10 for a 16f648a microcontroller. But if I buy them from microchip they are just over $1. - You can also request free samples from microchip. I think you can get about 6 free samples a month. This has been very handy for me in experimenting with different chips. At this stage, you will want to program your microcontroller with the santas scramble game hex file. There are many different programmers out there so I will not be able to explain the exact process. You can download the hex file from the bottom of this page. Simply open the hex file in your programming software and burn it to the microcontroller. Then you are ready to commence construction! Step 3: Cut the Board to Size. The veroboard (strip board) will need to be cut to 32 holes by 23 holes. Please see the photo below for reference. Note that the tracks are aligned vertically. Step 4: Soldering All the Components Onto the Board. But for now, lets just solder in the components. Have a look at the photo's below for the location of each component. One item to note is the 8x8 LED matrix. You must insert it the correct way otherwise it won't work. See the third photo for a close up. Also you should note that both the microcontroller and the 7442 IC are mounted such that pin 1 is to the bottom left. You can see both the top (component side) and the reverse (solder side) of the board. As it is, we have shorted out all of our IC's legs from top to bottom as well as the resistors, buttons and LED matrix. We need to cut a whole heap of tracks in order to make sure that we are not shorting out any of the components. Please refer to the photo's below for a look at where to cut the tracks. The first photo shows where the tracks have been cut by red ovals. The second photo is exactly the same just with the ovals removed for clarity. Step 6: Study the Schematic. You can download the schematic below. Have a look at it since you will need to match the circuit you are building, to this schematic. It is very likely that some of the components that you will be using will not match my components exactly (E.G the led matrix and push buttons) so it is important that you study the schematic diagram and as long as you wire together yours accordingly, you will be just fine! 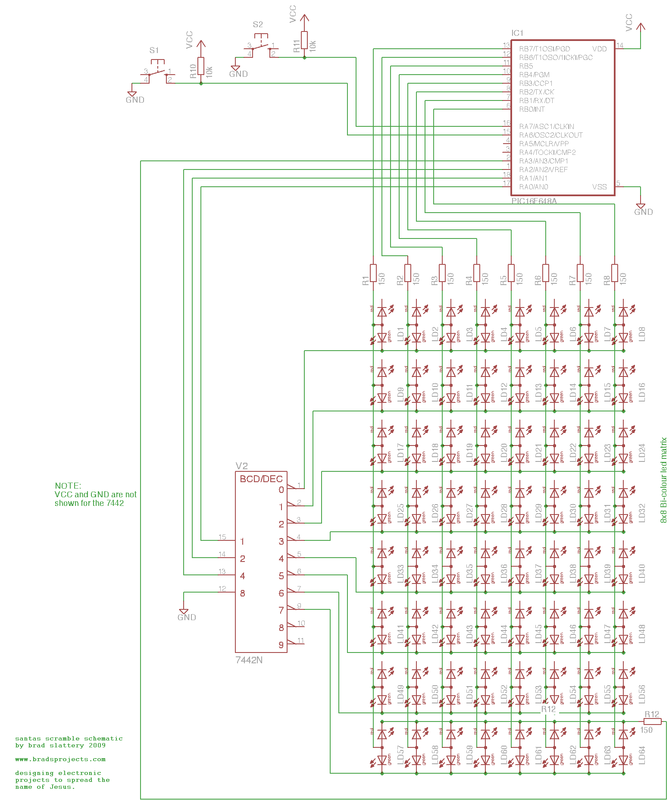 I have also included the pinouts for the pic16f648a microcontroller and the 7442 decoder IC. Power is provided by two CR2032 batteries connected in series (I.E the -ve of one battery is connected to the +ve of the second thus providing you with 6volts to power the circuit. This 6volts connects to the GND and VCC connections indicated in the schematic provided. Step 7: Completing the Circuit With Enamel Wire. Enamel coated wire is fantastic for veroboard projects. The enamel coated wire comes in many guages, but I prefer to use .25mm thick enamel wire. This can be bought in little reels at most electronic stores or online. Even though the wire looks like it is not coated (insulated) it actually is - with a very fine varnish so it is fine for the wires to touch each other (I.E. they wont short each other out.) Before you can solder these wires on though - you must first strip the ends. The easiest way to do this is to put a blob of solder on your soldering iron and then place the end of the wire into the molten blob, this will melt off the tip of the enamel wire which will give you a 'stripped' end ready to be soldered to the board. The first photo shows strands of wire ready to be 'stripped' the second photo shows those same wires with the ends removed of enamel. The third photo shows the completed board. With all connections made. you will also notice that I have used thicker wire with the green insulation. These are the power connections. Once your circuit is built you will obviously want to test it. Pressing either of the buttons will turn the screen on and the game will start to play. If you then press the down button, you player should move down. If you press the up button, your player should move up. If you hit a wall the game should stop and present you with the level number that you made it to. If you complete the game, then you should be presented with a smiley face. Pressing either of the buttons on any end game screen should take you back to the start of the game. If you dont press any buttons for approx 30 seconds, the game should go into standby mode and the screen will turn off. * PLEASE NOTE * upon further testing, standby mode draws quite a bit of current and as such your batteries will die in a matter of days EVEN WHEN NOt BEING PLAYED. I highly recommend that you add an ON / OFF switch to your circuit to fix this problem. Step 9: Cutting the Thick Cardboard to Size. Now as stated in the introduction, arts and crafts is certainly not one of my strong points. So this is where you guys can get creative! The main thing to have a look at in these next steps is the housing for the circuit board itself. All the extra decorations I will leave to you to let your imagination run wild! Step 10: Cut Out a Space for the Circuit Board. Repeat this step for your second piece of cardboard. Step 11: Install the Backing for the Circuit Board Housing. Now we don't want the circuit board to fall out, so cut yourself a 12cm square piece of thin cardboard and tape it to the rear of your circuit board housing. Step 12: Install the Circuit Board and Fill the Gaps. Now with the back plate on, you can insert your circuit board into the housing. This step just involves a little bit of manipulation in order to construct a piece that will fill the space. Now that the housing is complete you will want to make it look nice by adding decoration. The second photo shows the completed package with the screen square cut out. The third photo shows the rear of the card. you may have noticed that there a re no holes for the push buttons - that's okay because you can still press them even with paper ontop - nifty huh? Step 14: Stick Down Your Button Locators. I cut two little stars from a Christmas card for my button locators. I just stuck them down on top of where the two buttons are. Step 15: Construct and Attach the Card Flap. With the 'main' part of the card built, it is now time to construct the front cover card flap. You will again need a 12cm square piece of thin cardboard. Decorate it however you please (I used some more wrapping paper to decorate mine) The first photo shows the 12cm square piece of cardboard and also a 12cm square piece of Christmas wrapping paper. Once you have it looking just as you want, use two lengths of sticky tape one on the outside of the card and one on the inside to hold the flap in place. the second photo shows the completed flap in place. Just as with the previous test, if you press any of the two buttons, the game should turn on. Pressing the up and down buttons should make you move up and down accordingly. If you don't press any buttons for approximately 30 seconds, the game should go into standby mode. I really could have made this project better in a number of ways. 1. I should have included an ON / OFF switch. upon further testing, the standby mode actually draws quite a bit of current still and therefor the batteries will die in a couple of days even if you don't play it... So a power switch would fix this problem. 2. I need to work on my arts and crafts. Mine certainly could look a whole lot prettier! 3. Make the batteries more accessible for ease of replacement. 4. Maybe even replace the coin cell batteries with a mobile phone battery and include the charging circuitry so that the card could be recharged using USB? Step 17: Description of How the Circuit Works. I have made up a couple of pictures to help describe how this circuit actually works. Please note that the pictures below are of a single colour (RED) LED matrix whereas the Christmas card circuit actually uses a bi-colour (RED/GREEN) display. You will notice the image on the left has 64 LED's connected in an 8x8 LED matrix. There are 8 Columns where the cathodes are all connected together and also 8 Rows where the anodes are all connected together. The image on the right will be used to demonstrate how we get the matrix to do what we want. You may also have guessed that if we connect +5v to the top row of anodes then EVERY anode up the top will have +5v connected to it. The reason that only the top right LED turns on is because we have only connected ground to the right most column of cathodes. We need the combination of +5v AND ground in order to complete the circuit to turn on whatever LED or LED's that we want. Or perhaps you want to turn on an entire row? I will be using this next circuit to explain things a little further. To help us with scanning the display, we use a 7442 1 of 10 decoder. Now you may very well be asking "That's a pretty picture, BUT how do we draw a picture with all of those LED's lit up at once if we can only 'activate' one column at a time?" We'll I am glad that you asked that question! there is a little bit of a trick to it. What you see on the 8x8 matrix is a face. BUT not all columns are on at the same time - infact only one column is drawn at any one time but we 'scan' through the columns so fast, that to the human eye it just looks like one steady image. If we were to slow down how fast we scan through the display, you would see something like the next photo. You will notice that we activate a column, then place eight bits of data on the data bus and it displays that data on just that one column. Then we move to the next column in line and then place a different eight bits of data on the data bus for that column. We keep doing this until we get to the end. That is one complete frame. If we were to do this alot faster then our brains would perceive this as one steady image. Similar to how your TV or computer monitor works. I hope this discription helps! I've been wanting to try my hand at electronics. This instructable is so well explained and illustrated, and looks fairly simple and inexpensive, plus I love making cards, so I thought this would be a good place to start... However I'm already stumped at step two. The direction to "simply open the hex file in your programming software and burn it to the microcontroller" makes me draw a blank. What is programming software? How can it be burned to a microcontroller? What would be helpful would be a link to different programming software sites (maybe 2 links, one for PCs and one for Macs) so novices like me can go to download programming software, and learn the really basic basics. I am sorry your question was asked a year ago, and nobody responded, INST seems to have a sleeping community. Hi, these different part numbers are all the same chip, however just built into a different package. The one I used is the I/P which is the ones with the legs that go through the board and get soldered onto the other side. The other two are smaller surface mount chips which have legs that don't go through the board but are soldered on the same side as the chip. You just need to cut them so that the copper is removed, leaving just a channel of pcb. To make sure, you can cut them with a stanley knife and then use a flat blade screwdriver (a small one) to make the channel a bit wider. and how do you solder so well? Hi thanks for the ible. I plan on making this, but i am a noob at soldering, but i do have some experience with electronics. I was wondering, where can i get the programming software for the hex file? I already downloaded it to see if i had it already but i dont. Also, I have a mac. This looks like a good project, but instead of using stripboard, I would like to make a PCB. Could you check my PCB design to make sure the pins are all connected correctly? Please note some of the resistors are simply wire links (R12-16). I am also having a lot of trouble programming the pic, I have the correct pic chip, but my pic programmer doesn't seem to like the hex file your provided. Would it be possible to send me a per-programmed pic (I can pay for the cost of the pic, the shipping, and your time), or I could send you my pic to program if it would be cheaper/easier. have you got your pic in the circuit when you try and program it? What programmer are you using? Also, why are you not using resistors with your LED's? If you don't use resistors, the internal resistance of the chips will need to drop the rest of the voltage (which increases the chips power consumption) which will most probably burn it out pretty quickly. I haven't made the circuit yet as I want to develop a PCB for it. My programmer doesn't like the hex file you provided, and it would be a lot easier for me if I could pay you could send me a pre-programmed pic. I did use your schematic as reference, but I had to put the LED display together myself from various datasheets as the pins on your schematic aren't labeled. Also, I do have 150 ohm resistors on pins 24, 21, 18, 15, 1, 4, 7, 10, and 11, but I am not sure whether they are in the right place or not, I was hoping you would check this for me. Sorry, I didn't realize how small that image was. Here is is in a higher resolution. You can get basically all of these components from any decent electronics store. I mainly buy my components online through ebay. If you buy in bulk, you can get some fantastic bargains!